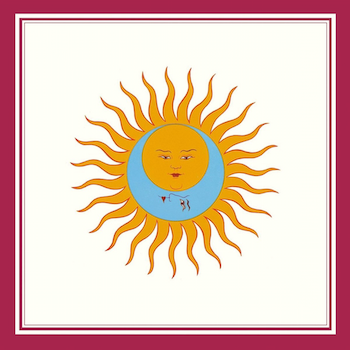 I met my pal Alan decades ago at art school; he was whistling in the hallway when I approached and said, “Excuse me, is that King Crimson’s “Larks’ Tongues In Aspic, Part Two”?” “Yes, it is!” he replied and we’ve been friends ever since. It’s an amusing coincidence that today, on his birthday, I was introduced (by way of a tweet from Louis Philippe) to the colossal musical talent of Rachel Flowers, a young visually impaired Californian who’s recorded an unbelievably faithful cover of that song, doing all the parts herself. Her many other YouTube videos and Soundcloud posts, including original compositions (the recent “Other Voices” is gorgeous) and more covers (Zappa’s “Inca Roads” blew me away), are well worth your time. Socks knocked off. This is a fantastic cover, and when I hear someone talented record this song I remember how great it is. (No wonder they ripped it off for Emmanuelle.) I wonder if Robert Fripp has heard this recording. My guess is he’d approve. Trucking Scouser on Need Help Identifying a Song? Here’s One Way to Find It. Mark on Need Help Identifying a Song? Here’s One Way to Find It. Yuki on Need Help Identifying a Song? Here’s One Way to Find It.